Faith Ringold is best known for the African-American story quilt revival in the 70s. 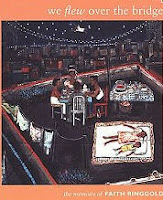 What many aren't aware of are her political paintings of the 1960s. You can see her work now at the Spelman College Museum of Fine Art through May 19, 2012.The exhibit is called, “American People, Black Light; Faith Ringgold Paintings of the 1960s." This is aher first solo exhibitions since 1990. The entire article can be read artdaily. 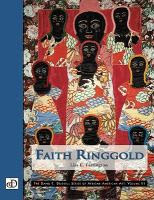 Books and video about Faith Ringold can be found in the Art Collection and the Literature Division.Click on images to connect to our catalog. The story of Faith Ringgold--activist, author, academician--is an uplifting look at a progressive artist who overcame discrimination and triumphed as a giant figure in American art, notable as an accomplished painter, a sculptor, a printmaker, and an art quilter. She has never abandoned her goal of searching for human dignity and empowerment for fellow African Americans while tirelessly fighting against discrimination. Faith Ringgold is a captivating look at the personal and professional life of one of the country's most notable female artists. One of the country's preeminent African-American artists and an award-winning children's book author shares the fascinating story of her life as she looks back on her struggles, growth, and triumphs in this gorgeously illustrated work. Faith Ringgold details the creation of the quilt she created to represent the diverse cultures and traditions comprising the area of Crown Heights in New York city.